Gutter Guard Mooroolbark - 3138 – Does it work? We are always looking for ways to make life easier! Imagine if you never had to clean your gutters again…wouldn’t that be great? Sorry to break the news…….but this maybe a false hope……. What is the real purpose of having Gutters? Simple…….to ensure water flows in them & down your downpipes & AWAY from your property. Gutters are not there to collect leaves & debris. Should I install a gutter guard product in Mooroolbark - 3138? The truth is………we don’t know of any product that is maintenance free. If you have a fixed Gutter Guard product, we have to spend more time removing it so we can clean it…….resulting in more $$$$ for you. What do we recommend & how can we help you? We recommend the installation of a Gutter Brush in Mooroolbark product over your downpipes only. This is a cost effective solution, easy to remove; clean & replace. It works best when combined with a regular gutter cleaning schedule to ensure that the debris does not block water flow to your downpipes. 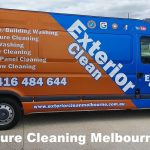 How Much do we charge to clean your Gutters in Mooroolbark - 3138 & Install Gutter Brush? Give us a call & we can offer you a FREE quote based on your property.